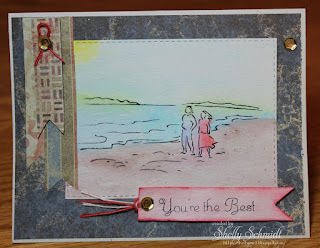 For the Sweet Stamps "Anything but a card" challenge, I decided to make a tag ..... The challenge link is HERE. 1) Place in a container and spritz some water in and use as a watercolor. A little goes a long way, so be conservative when you make up your first couple of batches. See the Julie Fei-Fan Balzar link for visuals on this method. 2) Use them as a wash- Sprinkle them on a watered surface and let them spread. 5)Place some Color Burst in a mister and add water- makes a spray. 6)Emboss your image for an emboss resist. 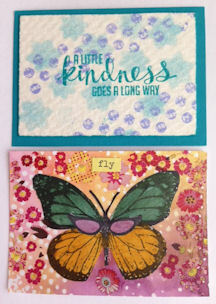 You can apply Color Burst to cardstock first, then emboss as well for a colorful resist. 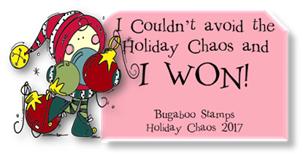 (there will be color under the embossing, then add color on top of it). 7)Apply over a stencil and spritz with water. Use the top side on another sheet of cardstock. Or, flip the wet stencil over onto another piece of cardstock and start spritzing on the color. 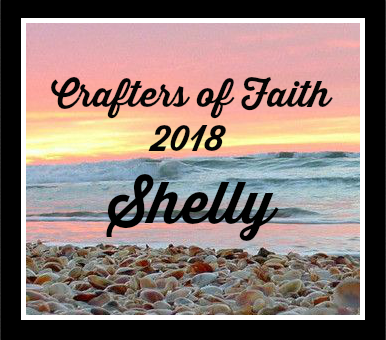 (Lindsay the Frugal Crafter). 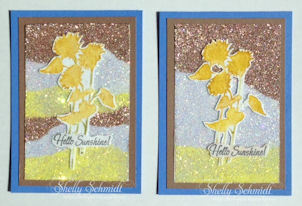 I tried this using a SweetCuts die using white glossy cardstock. 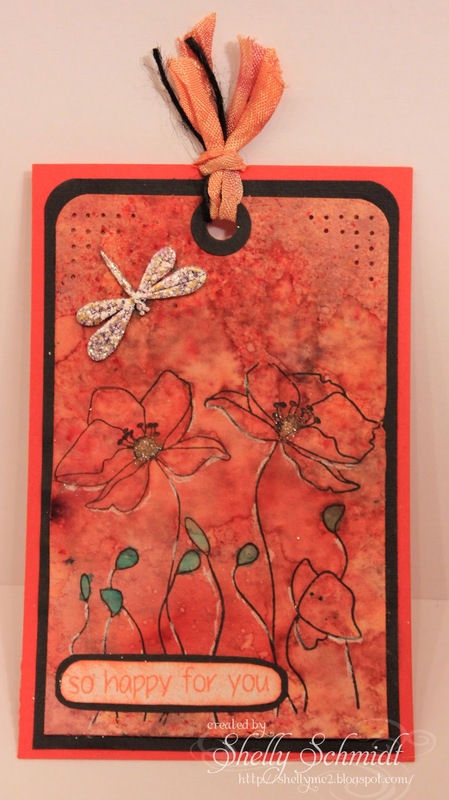 8)Apply to your craft mat, spritz and blot your paper in the wet pigment. 9)When good and wet, use your heat tool to 'blow' or move the color around. 10)Add flecks or droplets of color using a paintbrush/toothbrush. 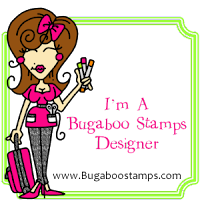 11)Use baby wipe- apply color directly to it and use as a stamp pad, or use to swipe color directly to cardstock. For more faded colors, spritz the baby wipe with water first- it dilutes the color. 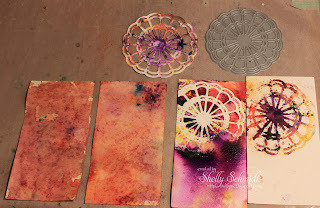 12)Use Color Burst on cardstock. Place color side against a stencil, spritz H2O on the back side and let dry. You will have ghosting on the color side of the cardstock once it dries. Do not set it on anything when drying that will affect the ghosting process. (Sparkle n Sprinkle). 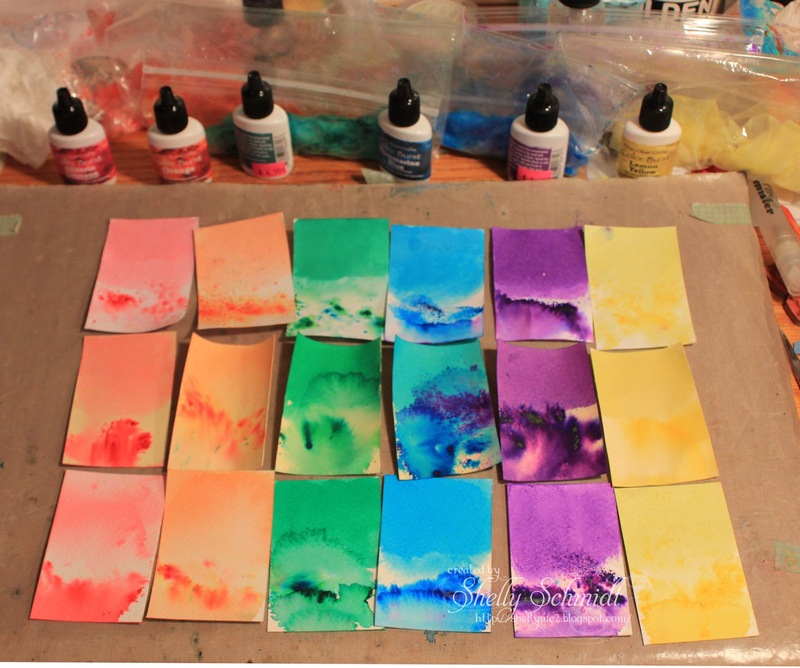 13)Spray 5-6 spritz of Color Burst in a container of H2O, and place sheets of watercolor paper into it- ~ 1 hour- the color will 'wick' up onto the cardstock. You can turn over and do the other side s well (Sparkle and Sprinkle). 14)You can dye your Seam Binding/ribbon/lace with it. 16) Cut out a die using a piece of plain paper, place over the Color Burst cardstock and you will have a colorful opening where you cut out the die. OR, reverse that and cut the die out of the Color Burst cardstock and have the plain cardstock showing thru- the examples were white and black, any color would work. 17) Use Masking fluid on the cardstock- let dry, then apply the Color Burst ( eg a written word like LOVE). When you peel off the masking fluid ..... it will show off the resist area in the color of the base cardstock. My tag was made using the 2nd tag one from the Lt........ I got some of the Color Burst on the mat, so I misted it and picked up the color off of the mat- #8 on the list above. The ribbon on my tag is from the Orange Color Burst. I would love to hear any additional ways you can think of to use Color Burst- looks like I am going to be having a blast experimenting! 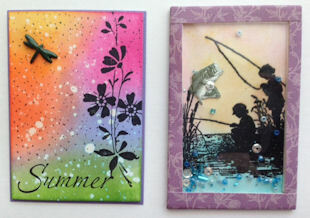 I was able to join in the last Technique Junkies ATC swap- we send in 6 ATC's and can use any TJ technique from newsletters or CD's. I just love trading these technique ATC's- and see IRL techniques I have not done and NEED to try! 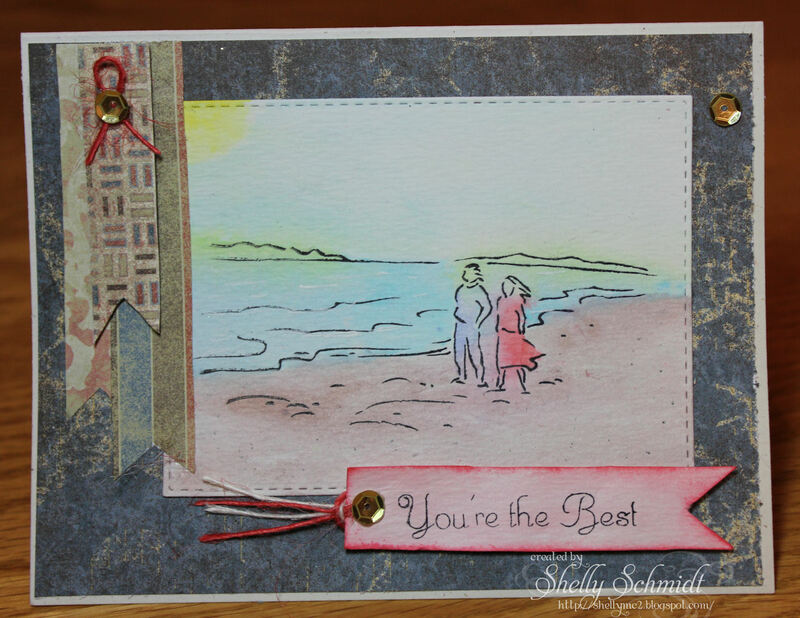 We are creating for Father's Day this week at SweetStamps.com - challenge link HERE. Another beach scene for my project this week : ) Peerless watercolors were used to color in this serene scene. I stamped the image on watercolor paper with Black Stazon ink. The DP is retired SU. 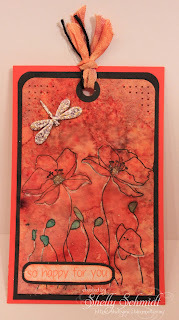 I made the sentiment tag with watercolor paper, sponged on the Valentine ink and used the waterbrush to color the tag. I colored the image with Distress Markers directly on the rubber, huffed on it (to re-moisten the ink) and stamped on white cardstock. I did add additional touches of green(s) to the grass once the image was stamped. I also added some inks around the outlines of the flower pots and the watering can. 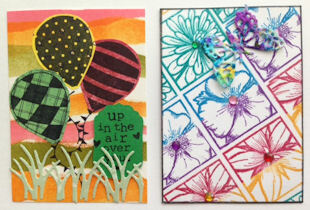 Our Challenge at SweetStamps this week is Anything Goes - and I made a set of fun ATC's. We hope you will join us in the challenge- Anything Goes! I am offline for an unknown period of time- my graphics on my computer went haywire and I had to send it in for repair. I have a very old model computer to work with- and if I can figure out how to load pics, edit them, etc...I will be back live.....!